It’s hard to find any casino player that is not familiar with Monopoly slots. These are truly iconic games, which were quite revolutionary when first launched. 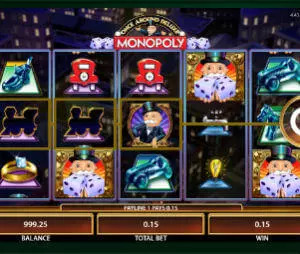 Due to the enormous success of the original game, there are plenty variations of Monopoly slots online – Monopoly on The Money, Dream Life, Bring the House Down, Monopoly Hot Shot and now, Monopoly Once Around Deluxe slot. You can try the free version here, but before you play this slot machine for real money you should know that the official RTP stands on just 94%, which is pretty low. This game was developed by WMS in 2003, but only now it makes its way online. Btw, you should check Monopoly Big Event slot. It might not be the most exiting game, but with 99% payout, it’s definitively the best paying slot you can find. Monopoly Once Around Deluxe slot has the usual 5×3 layout with 15 pay lines. The minimum bet is 0.15 and it goes up to 70. There are three special bonus features: Pick Me bonus, Game in Game bonus and the Free Spins. The game is available on PC, Mac and Mobile. The RTP here stands just on 95.95%, which is more than ok for a slot machine in Vegas casinos, but there are some better options online.